Throughout the war, attacking forces tried to achieve a breakthrough, creating a gap in the enemy line large enough for forces to move through, behind, and beyond the enemy defense system. To do this, artillery was used to weaken defenses, infantry to overwhelm defenders and create an opening, and cavalry to pass through rapidly, getting behind enemy lines to attack from the rear, or to move on to strategic objectives, such as communications and supply hubs. Introduced in 1916, but first used effectively at Cambrai, the tank helped the Allies achieve the breakthroughs they had been seeking. As the war went on, attacks were preceded by increasingly large bombardments - longer, with more and heavier guns, followed by assaults by greater numbers of men. Different types of shells were used in the bombardments: explosives to destroy defenses, shrapnel and gas to kill and wound defenders. A preliminary bombardment announced an imminent attack. 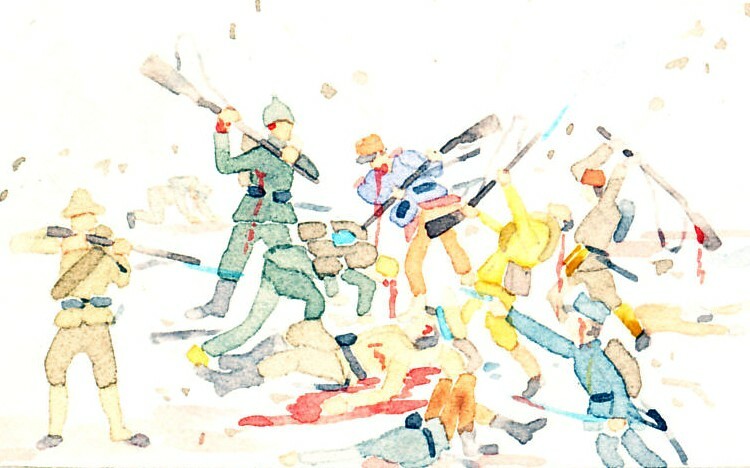 When the bombardment ended, defending forces could rush to defend against the assault. An alternative to the lengthy preliminary artillery assault was a short and violent lightning bombardment. The Brusilov Offensive began with a lightening bombardment. A standard infantry tactic was to attack the strongest points, as, having overcome those, the rest would fall. Armed with the machine gun, the defender repeatedly defeated this tactic. An alternative was "Hutier Tactics," named for German General Hutier, in which specialized shock troops exploited weaknesses in the defense, and bypassed areas of resistance, leaving them for other specialized troops to mop up. An example was the Battle of Caporetto, in which the Germans used Hutier tactics they had first used in Russia. Other armies including the French and Italian imitated the German in creating shock troops.